I love this evening. In Scandinavian traditions, December 23rd is Lille Julaften -- Little Christmas Eve. Taking note of this night spreads the pleasure of Christmas forward and intensifies anticipation. When I lived in Norway as a teenager, preparations for Christmas did not really begin until Lille Julaften. 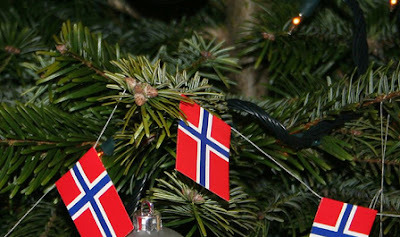 That was the day when people shopped for gifts and put up a tree which was decorated solely and purely with white lights, Norwegian flags, and small balls of white cotton snow. Lille Julaften became part of my life as a young mother, wife, and artist in Cleveland as we threw a big party that drew together people from all parts of our lives -- neighbors, friends, family, work colleagues, and eventually friends of friends and friends of family. The preparations were daunting -- huge quantities of eggnog and strong punch, buckets of 1/2 inch round Swedish meatballs. I accomplished Herculean feats of lefse-making and fragile cookie cakes. And it was all wonderful as everyone I loved gathered together. So tonight, even if you are far too busy and your list of tasks is still too long, even if the Christmas music that has played in your ears since Halloween has grown tedious, even if you are sad, even if you miss someone, perhaps there will be a moment of quiet joy and sweet anticipation of better times as Lille Julaften works its small magic. Thank you so much for reminding us of this time to stop. I remember your little trolls, were they? so charming. We have had a big deep snow and today the blue sky and sun are sparkling and changing all the colors. Take it easy, and enjoy! Sounds like a lovely day, and a Happy Lille Julaften to you, dear friend. Swedish rye and cardamon breads and much more. Following the dinner, we opened presents before going to the midnight service. Christmas day we gathered together with relatives (mom being the youngest of 9) for traditional food and more celebration. A time of joy with the warmth of family. Sankta Lucia festival this Sunday at our Gloria Dei Liurheran Church in South Bend! The congregation is mostly Swedish, so this has been an annual celebration my whole life! Loved the memories of the food. Potatis Curve? That horrible jellied veal? Herring in Sour Cream, rice pudding, Blitz torte? My mom always makes the meatballs, her "secret recipe". Oh, Michele. I confess, there were some bad gastronomic moments in Norway. Being the American representative of all things embracing and welcoming, I ate lots and lots of lutefisk. fishcakes, and gjetost. Not a fan of things that lie in tart milk products, I couldn't do the herring in sour cream. Put the little fellows in adobo and I am fine, however. Gloom? Do you mean how dark it was? Coming from Cleveland, I didn't feel the lack of sunshine. If you mean Gloog or Gloegg or Glog, or any spelling of it... that I liked. My way of doing Swedish meatballs is to make them small and mire them in hot barbeque sauce and lots of shoyu. Then I dump them over Amish noodles for the best of all possible worlds.